A very medieval tasting recipe. It’s an ode to dried food, except the onion all ingredients are dried. This makes it an excellent dish for end of winter. The recipe was meant for fishdays or for Lent. If you prepared it for a fishday you could use butter, but in Lent when not only meat, but dairy produce was also banned from the kitchen, you had to use oil. More about Lent can be found with the recipe for Fake Fish. On the left is a detail from the bench’ end in Saint Nicholas’ Chapel in Norfolk from 1419. It is now kept in the Victoria & Albert Museum in Londen. It depicts a boat fishing on cod, and I think the three headless fish below are stockfish. Drying is probably the oldest way to preserve food for a longer time. This medieval dish contains stockfish, that is dried cod, dried peas, dried apples and raisins (dried grapes). Although I have to confess that the recipe just says “an apple”. Through the process of drying, moisture dissappears, making the food in question lighter and smaller, and often also enhancing its taste. Think of dried mushrooms or tomatoes. The advantages of dried food are clear. Without great loss of nourishment value, it is easier to transport, and less vulnerable for decay. In our Dutch climate it is difficult to dry food outside, there is simply too much humidity. But it was done anyway. 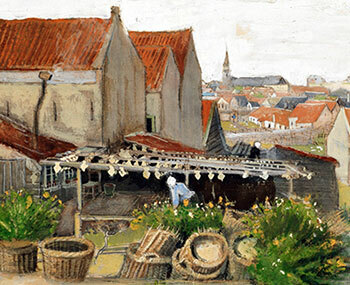 On the picture is a detail from a painting by Vincent van Gogh from 1882, with a drying house where plaice is hung out to dry. It is difficult to imagine that those supple swimming seafish can be transformed into a rockhard, flat planklike fish. And it is even more amazing to see that plank turn back into soft, white fishmeat. Why go through all that trouble when you can eat fresh fish? Until quite recently in human history, transport was slow, and refrigeration not always reliable. So fresh fish was hard to come by. And in the many, many days that the church banned all meat from the medieval menu (Lent and two or three days a week), fish was an indespensible ingredient. To be able to eat stockfish, you have to be prepared to work hard. First it must be hammered with a wooden mallet for some time, then soaked in water for a couple of days. The water must be refreshed every eight hours. Then you can remove the skin and bones. You end up with about twice the amount of edable, cleaned fish meat in weight that what you started with in dried fish. Be careful that you remove all fishbones, use your fingers to check. There is a Dutch children’s song that used to be popular, Advocaatje ging op reis (tiereliereliere) (text), about a little advocate that goes on a journey and in an inn gets a stockfish for breakfast. A bone sticks in his throat, and the advocate dies. The original French version from the seventeenth century mentions a poisson as the guilty one, not specifically a stockfish. The recipe is from the third volume of the Ghent convolute KANTL Gent 15 (vol.3, recipe 309 according to the numbering of Braekman). Here on this site I’m working on an edition of the manuscript (at the moment I am at one third of the second volume, progress is slow). Item neemt aretnat ende wat boter oft olij dan neemt eenen appel ende een hooft iuns ende een goet deel rosijnen ende wat greijn ende peper ende poeder ende laetet daermede stoven ende als ghijt oprijcht dan stroijt daar geijnberpoeder op. Take liquid from peas and some butter or oil. Then take an apple and an onion and a lot of raisins, and grains of paradise, pepper and fine spices. Let it braise with this, and sprinkle with ginger powder when you serve it. Real stockfish is just dried, not salted. So it is not identical to clipfish or bacelaõ that is salted as well as dried. Try to find the real thing, and try to buy pre-hammered stockfish that you only have to soak and clean. Maindish for 2 persons, or first course for 4 persons; preparation in advance 36 hours; preparation 1 hour. 36 hours before you start cooking, so the morning of the day before you want to eat this dish as supper, put the stockfish in water. Change the water about every eight hours. After this, remove the skin and pick out all the bones. If you use whole green peas, you’ll have to soak those too for a night. And when you cook them, you’ll have to remove the skins (see this recipe for stock for Lent). Split peas do not need to soak and the skins have already been removed. Cook the green peas or split peas until almost done: split peas 30 minutes, whole peas 45 minutes (and remove the skins). Fry the onion in butter or oil. Add stockfish and apple, fry for a little longer. Then add the boiled peas with the remain liquid and the spices, stir well, and simmer for twenty to thirty minutes. Add the raisins ten minutes before the end. This is a typical winter dish. With butter for the weekly fish days, with oil for Lent. Just as with Dutch traditional pea soup, this dish thickens overnight. I preferred it on the day of cooking. In the recipe there is mention of poeder which I translated with fine spices. Ready-made mixtures of spices could be bought in spice shops, and some cookbooks also give recipes to make your own spice powder, like the Ménagier de Paris in 1380. I presume that spice handlers had their secret recipes for such mixed spices, and that there is not just one recipe for such a powder. Just look at other recipes in the same text, and comparable recipes in other texts, to decide which spices you use. W.L. Braekman, Een nieuw zuidnederlands kookboek uit de vijftiende eeuw. Scripta 17, Brussel, 1986 (vols two and three). Manuscript KANTL Gent 15: on this site there is an edition in progress of this manuscript, with translations in modern Dutch and English. 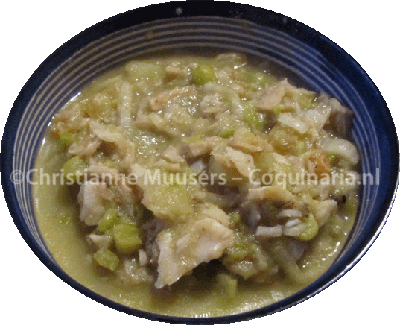 A medieval recipe with stockfish and peas for Lent, with mainly dried ingredients. 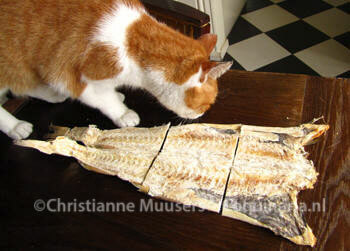 Preparing stockfish is laborious, but worth its while!